ISO 639 (ISO codes for languages) code for Slovenian is “sl”. There are no special characters used in case of Andrej Praznik (born 1874 in Velike Lašče, Slovenia). But Slovenian form of Andrew would sound completely different, if it stayed written as Andrej. Also the Praznik surname was correctly recorded in case of Andrew’s arrival to United States (Ellis Island,1899), but later in different Census records they obviously did not check any documents, though we could find: Prasnik, 1910; Prosznik, 1920; Proznick, 1940; and finally as currently used in USA: Proznik. Since Agnes arrived in United States in 1900 and Mary Prasnik was born in 1901 one could assume that Andrew and Agnes got married in 1900/1901. From US Census records we could conclude that their oldest daughter Mary left their home before she was 19 years old. Agnes stayed misterious also after last record search. She died on November 17, 1937 but documents were not available for authorities: no data of her Slovenian parents are recorded, as we can see for her husband Andrew. Andrew died 6 years later, on May 27, 1943, in the middle od World War II, which established very dramatic situation in his home town Velike Lašče. However, Andrew Praznik left his homeland for better life. It seems he succeded with hard work in Minnesota, U.S.. He owned a house in Eveleth (Ward 1), where the family lived at least from 1910 (in 1905 Agnes and Andrew lived in Fayal, St. Louis). He hosted several other Slovenians, who were labourers in the neighbourhood. 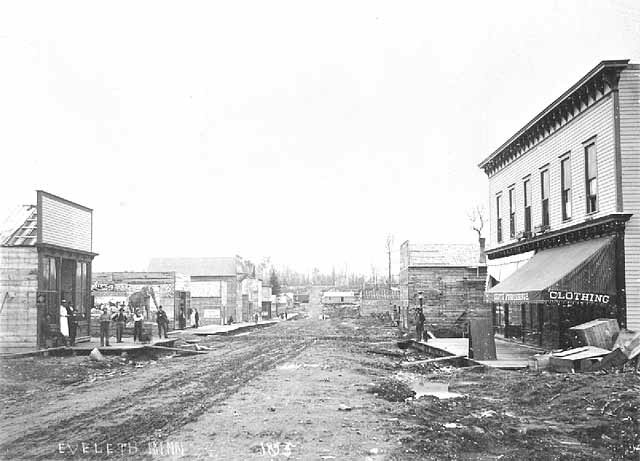 Eveleth’s population jumped up to 3,500 in 1901: main street view from Jakson street. This entry was posted on 03/01/2015, 19:48 and is filed under Roots. You can follow any responses to this entry through RSS 2.0. Responses are currently closed, but you can trackback from your own site.